The mysterious Fisher King is a character of the Arthurian tradition, and his story may sound familiar: suffering from wounds, the Fisher King depends for his healing on the successful completion of the hero's task. There are many different versions of the story of the Fisher King, and the character is not represented uniformly in every text. In the Middle Ages, Chrétien de Troyes' Percival makes him a completely ambiguous figure, while Wolfram von Eschenbach provides him an elaborate background in his Parzival. 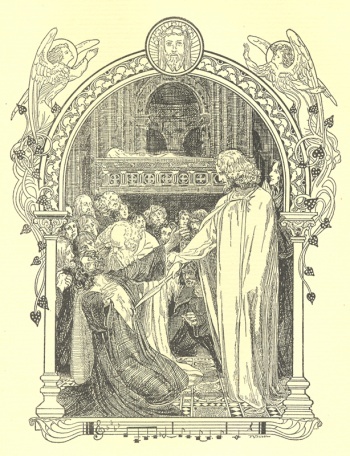 The Vulgate Cycle expands the Fisher King into multiple Maimed Kings, each suffering from some type of wound; yet Thomas Malory virtually ignores the Fisher King in his Morte Darthur. Modern texts treat the Fisher King less as a character and more as a motif: The Fisher King also appears in various films, from Eric Rohmer's adaptation of Chrétien's Perceval to Terry Gilliam's buddy comedy, The Fisher King. In every version of the story, though, the Fisher King is completely helpless and depends on another to alleviate his suffering.